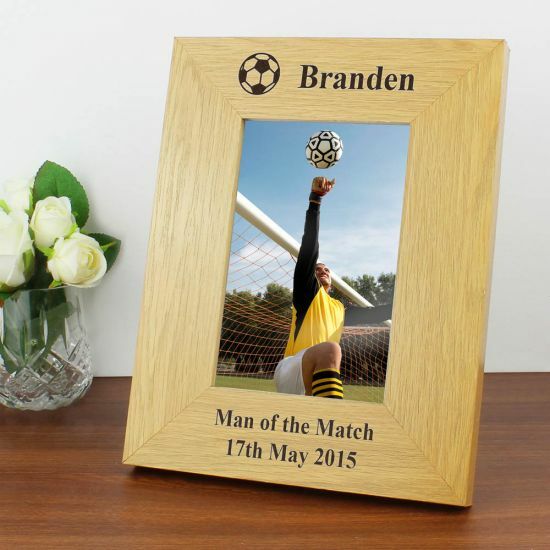 Personalise this 6x4 Oak Finish Football Frame with one line of a text above the photo of up to 15 characters and two lines of 25 characters below the photo. Text will appear as entered, if you wish to have the line above the photograph the same as the image, please enter this in UPPER CASE. This frame holds a 6x4 portrait photograph. This frame has an Oak Veneer finishIdeal for Christmas, Fathers Day, Birthday, Anniversary and Valentines.